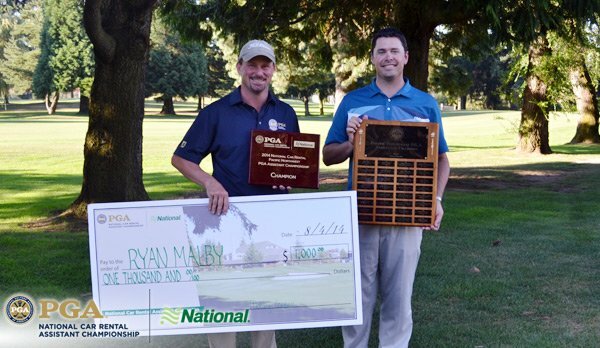 PGA Professional Ryan Malby of Iron Horse GC won the National Car Rental Assistant Championship today at Rainier G&CC. 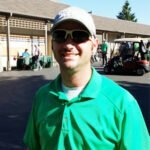 He won in a 4 hole playoff against PGA Professional John Cassidy of Alderbrook G&YC. PGA Professional Chris Lisk of Glendale CC finished in third place. Malby and Cassidy both birdied the first hole of the playoff. They proceeded to both par the second and third hole before Malby makes a fantastic birdie on hole four to win the National Car Rental Assistant Championship. Congratulations to Travis Haugen of Mill Creek CC for his hole-in-one in the afternoon round. Malby, Cassidy and Lisk all earned honors and advanced to the 2014 National Car Rental PGA Assistant National Championship on the Wanamaker Course at the PGA Golf Club in Port St. Lucie, Florida – October 30 – November 2, 2014. This year’s Assistant Championship marks the 38th Anniversary as a National event but the PNW Section has been conducting the event since Fred Pelzer donated the trophy in 1965. Designed and built by Bob Collins, Rainier Golf & Country Club opened it’s first 9 hole “golfing grounds” on September 15, 1920. It was considered one of the finest “out-in-the-country golf links” in the Seattle area, with the second nine opened for play in the summer of 1924. Rainier, the second oldest private golf club in Seattle, has matured and evolved into one of the most imaginative and demanding tests of golf in the Northwest. The course is a shotmaker’s delight; it rewards power, finesse, and most importantly, accuracy. Host PGA Professionals Carol Brogan and Darren Black are excited to host.